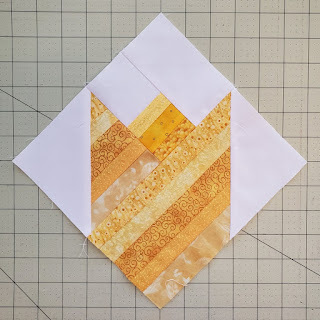 For the March Island Batik Ambassador challenge, Vintage Re-imagined, I wanted to work with a vintage block that I could create using one of the Island Batik precuts I had and I also wanted a block that could showcase all the fabrics in the pack. 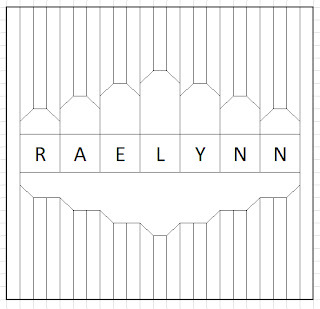 I decided on the Jewel Box pattern. I had a stack of 10 inch squares of Island Batik's Moroccan Bazaar I purchased last fall that was perfect for the "jewels". 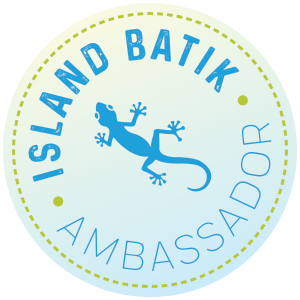 The other fabrics were provided to me by Island Batik for being an Island Batik Ambassador. I used a full three yards of the solid black batik and half a yard of the Orange print for the binding. After doing some research on the internet I learned the name Jewel Box was popularized by Eleanor Burns in the late 1990’s. 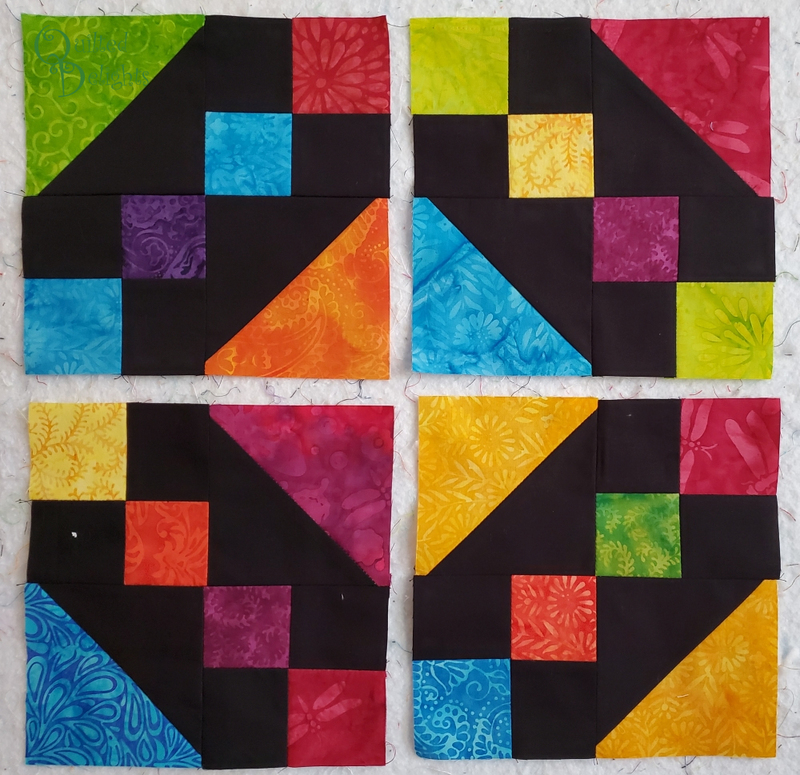 The actual Jewel Box block is made up of four smaller blocks. 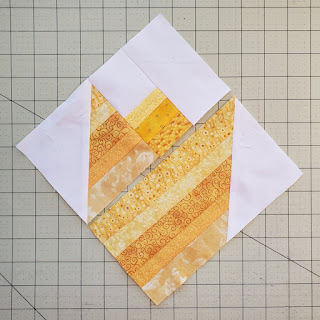 By rotating them with the color of the HSTs on the corners it creates the Jewel Box block. 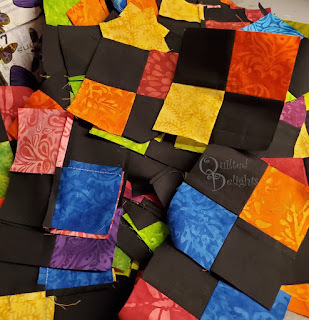 For this quilt I was able to use all but two of the 10 inch squares with very little waste. 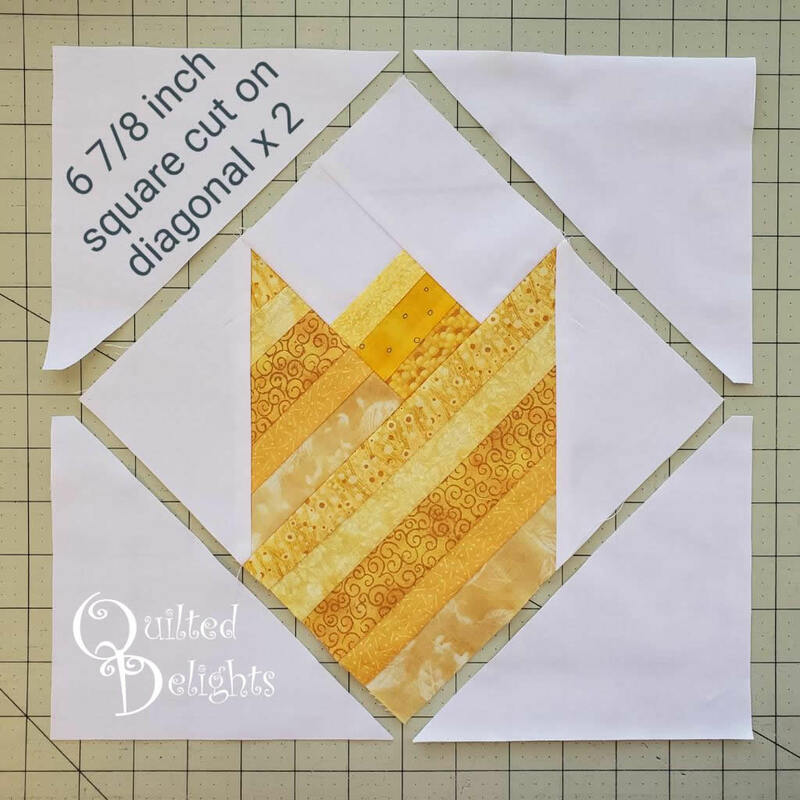 I cut the 10 inch square in half and used that half to get two 5 inch squares for my half square Triangles. 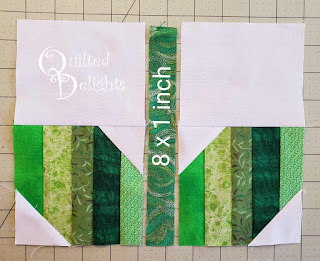 Then I cut the other half into two 2 2.25 x 10 inch strips to make the four patches. I cut the black background to match. 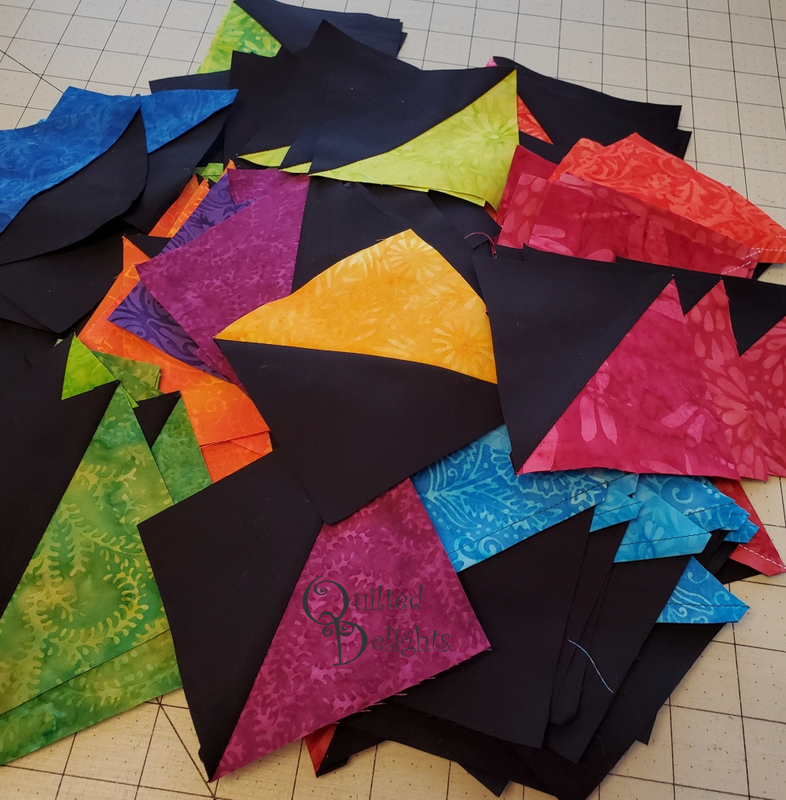 I needed 160 HSTs and 160 Four patches. I laid out the HST and four patches on the design wall trying to make sure I didn't put the same fabric next to each other. I sewed a couple test blocks and then started sewing rows together in strips. 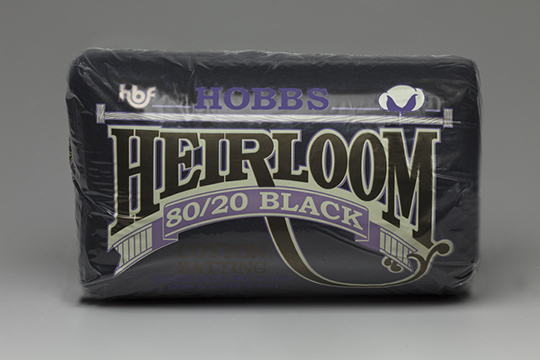 Hobbs Batting sent some fantastic 80/20 black batting to use as an Ambassadors so I tried it out on this project and it turned out great! My "jewels" are poppin'. 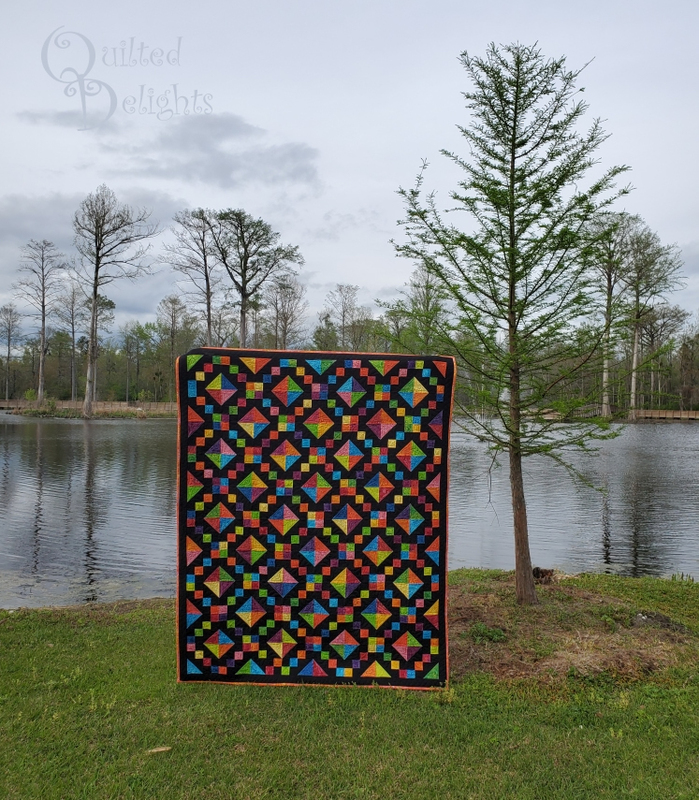 Can you see the black batting in the above picture on the edge of the quilt? It blends right in with the 2.5 inch border. The quilt measures approximately 61 x 75. 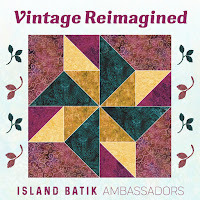 If you want more vintage re-imagined inspiration check out the blogs of the other ambassadors. 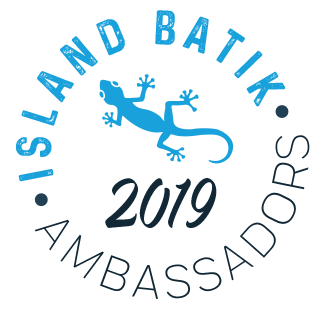 You can find them all here: 2019 Island Batik Ambassadors. Hey everyone and welcome to my day of the All About Strings Blog Hop hosted by Carla of Creatin' in the Sticks. The Hop is running till Thursday, so make sure to follow along for some fabric String inspiration. The full schedule is listed at the bottom of the page. I decided to go with a Springtime theme with my Strings. I am calling this one Spring Strings. 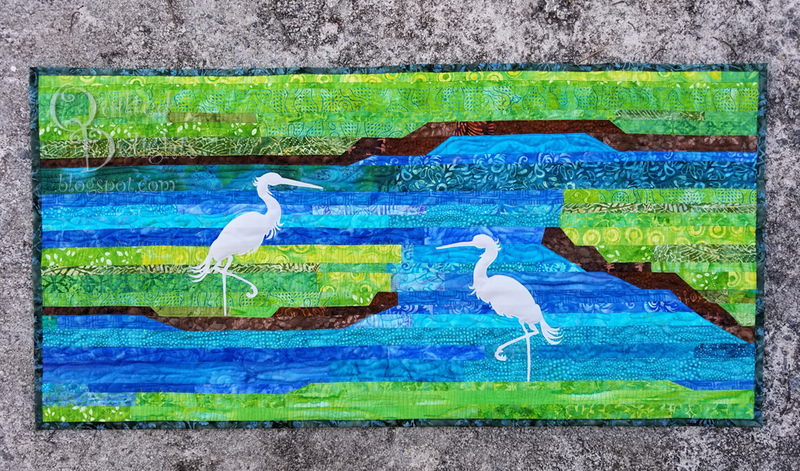 It measures approximately 72 x 54 inches. I want to show off another smaller string project I made for the hop. 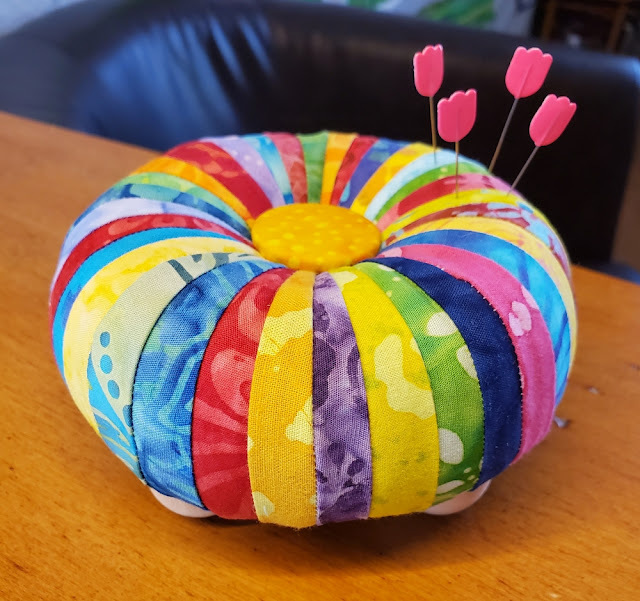 A mini tuffet pin cushion. Isn't it so cute! I have the pattern for the regular size tuffet but decided to start out with this mini one. It was quick to put together with some of my batik strings and not as frightening as I imaged it would be. I sewed it up in one evening. The pattern suggested spray painting the legs and I may do that once I figure out what color use. 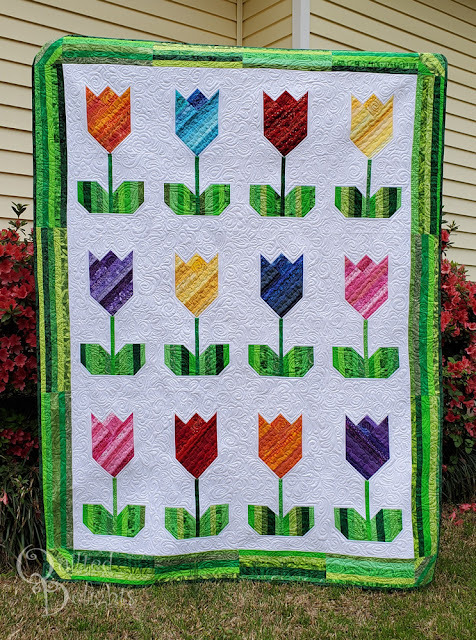 And now for the tutorial on the Tulip Block. or if you like, you can even make scrappy tulips. My strings measured from 1.25 to 1.5 inches. 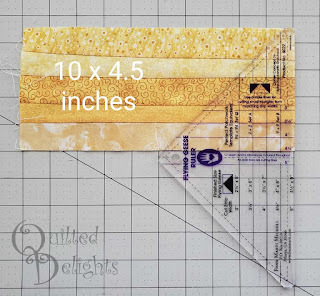 Create a 10 x 4.5 inch strip of your favorite strings. 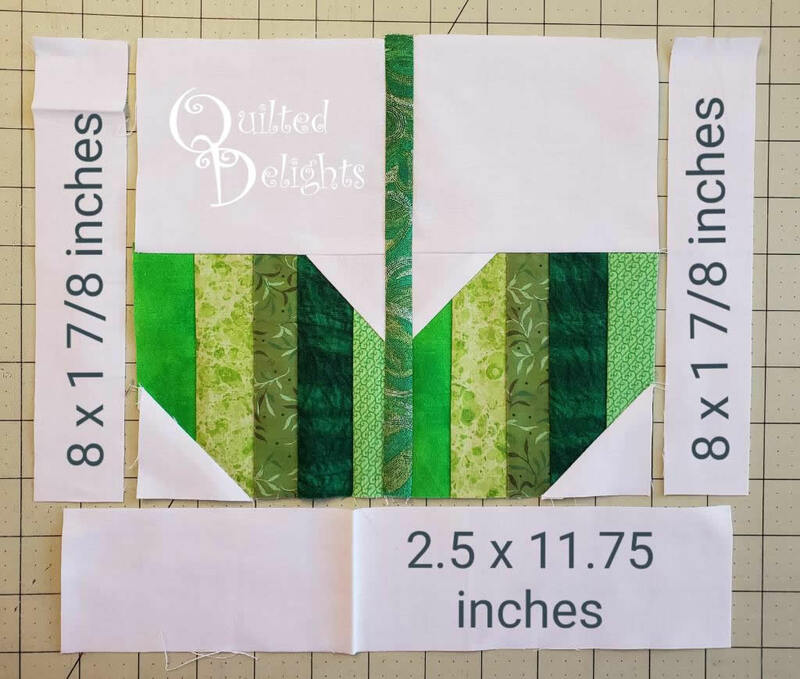 The strip can be a wee bit longer than 10 inches if your strips are longer. 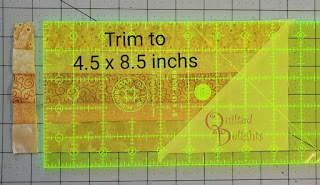 No need to trim them to exactly 10 inches, we will trim later, but the width does needs to be trimmed to 4.5 inches. 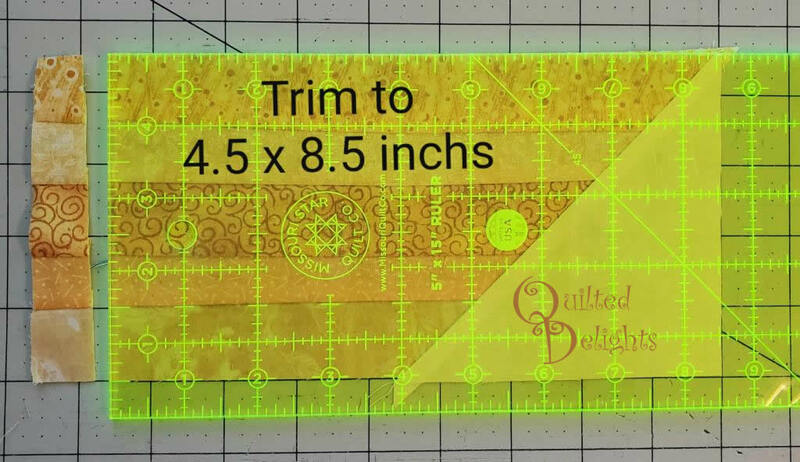 Clean up the right edge with your ruler and rotary cutter. 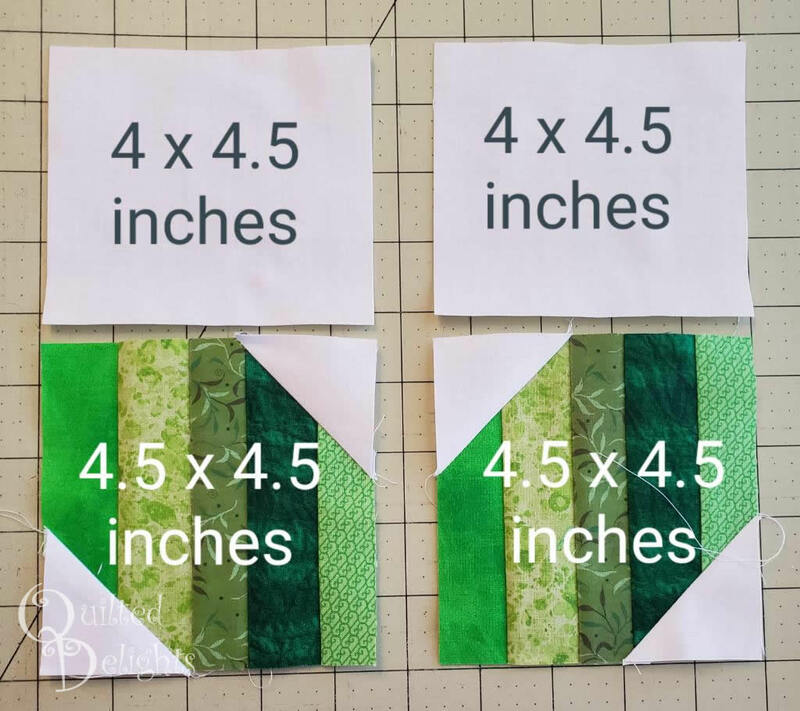 Using a 45 degree ruler, cut off a triangle from the right edge. 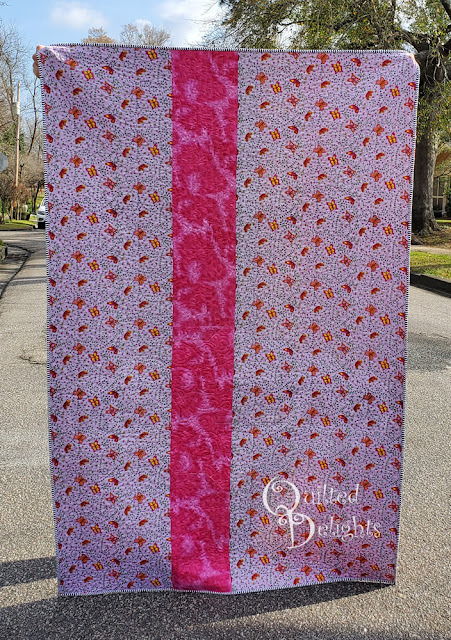 Make sure you leave 1/4 inch seam allowance on the right side. This can be easily done with the "Easy Angle Ruler" or any ruler that helps you make flying geese. 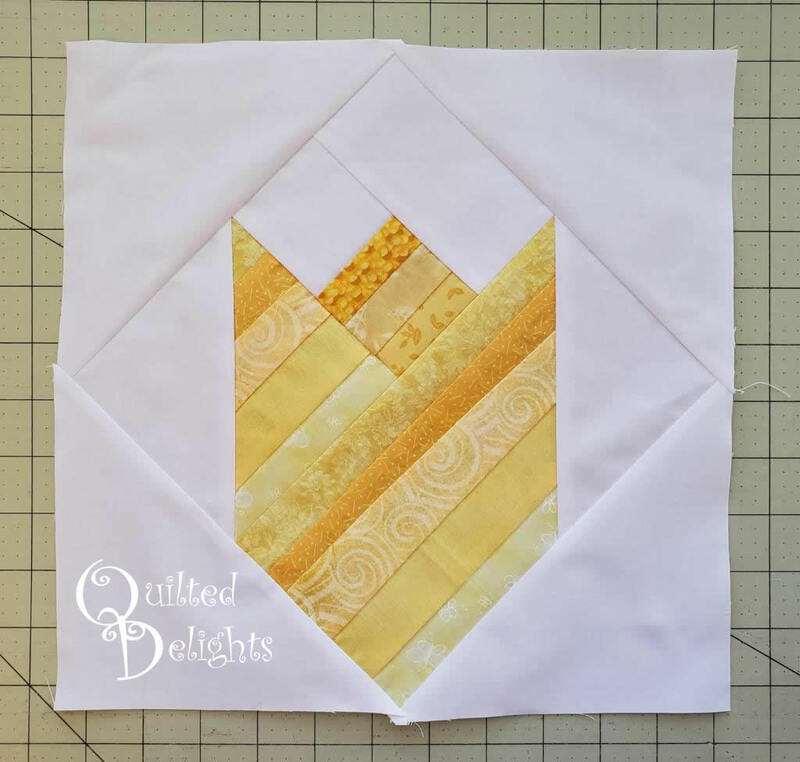 I used the Flying Geese ruler by Mari Michell because it was close. But you can also eyeball it. Just be generous if you eyeball it. It's easier to trim it down than cut a whole new piece. Cut a 5 inch White Square, sub-cut it on the diagonal to get two white triangles. Cut a 2.5 inch White Square. Make a small 2.5 inch square from your strings. Cut a 2.5 a 4.5 inch White Rectangle. Angle the two pieces from the original string 10 inch strip set to form the base of the tulip. Make sure all the strings are going the same direction. 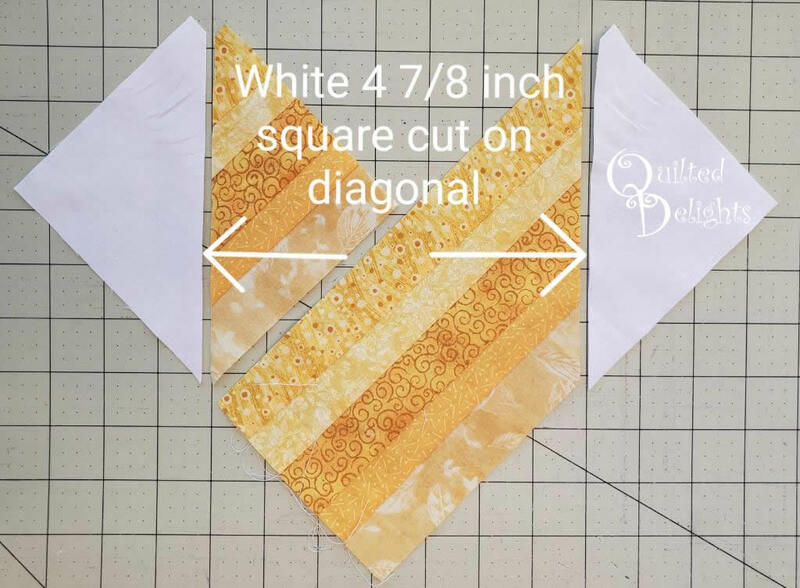 Sew a white triangle to both the angled edges of your larger string pieces. Press. 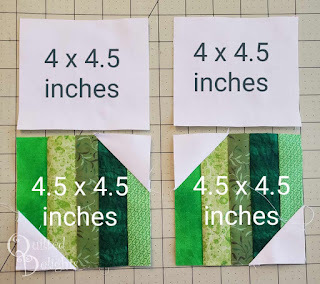 Trim the smaller square to 4.5 inches. 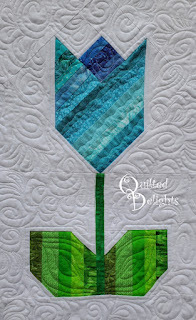 This creates a Half Square Triangle and will make one side of the tulip. Trim the longer string strip to measure 8.5 x 4.5 inches. 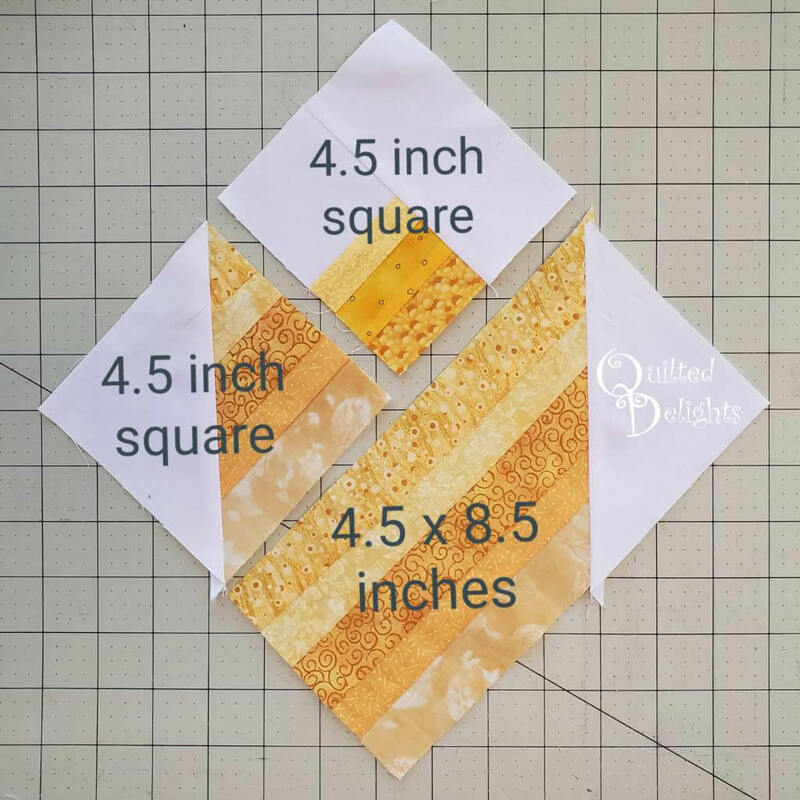 Sew the 2.5 inch String square together with the 2.5 inch white square. Press and then sew the 4.5 x 2.5 inch white rectangle to the newly sewn String/White rectangle. This creates the 4.5 inch square for the top of the tulip. 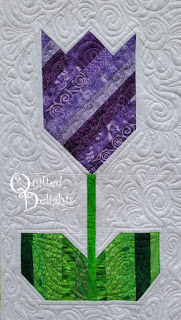 Sew the 4.5 inch top square of the tulip to the 4.5 inch half square triangle that makes up one side of the tulip. You should now have two halves of the tulip. 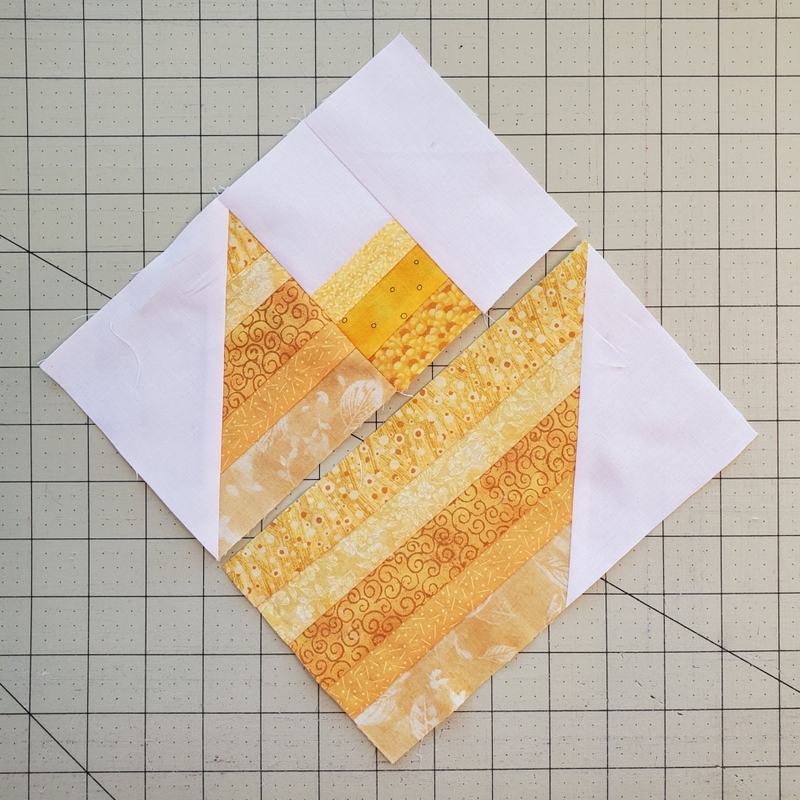 Sew these two halves together. 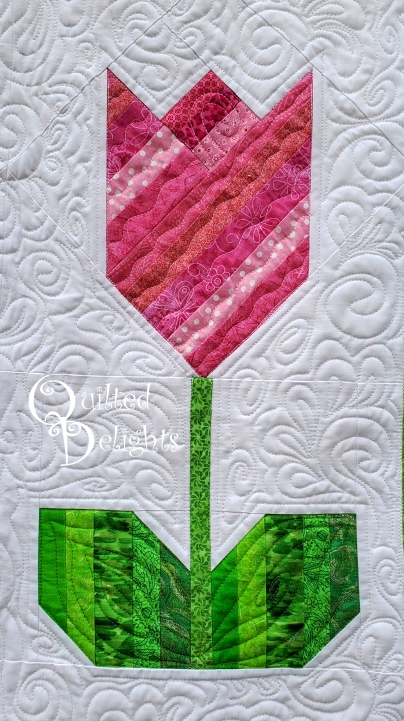 If all has gone well you should now have a cute tulip block that measures 8 inch square. 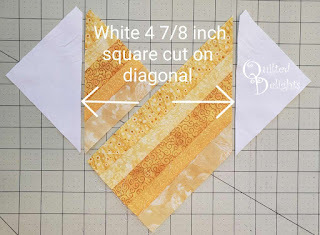 Cut two 7 inch white squares, sub cut these on the diagonal to give you 4 triangles. 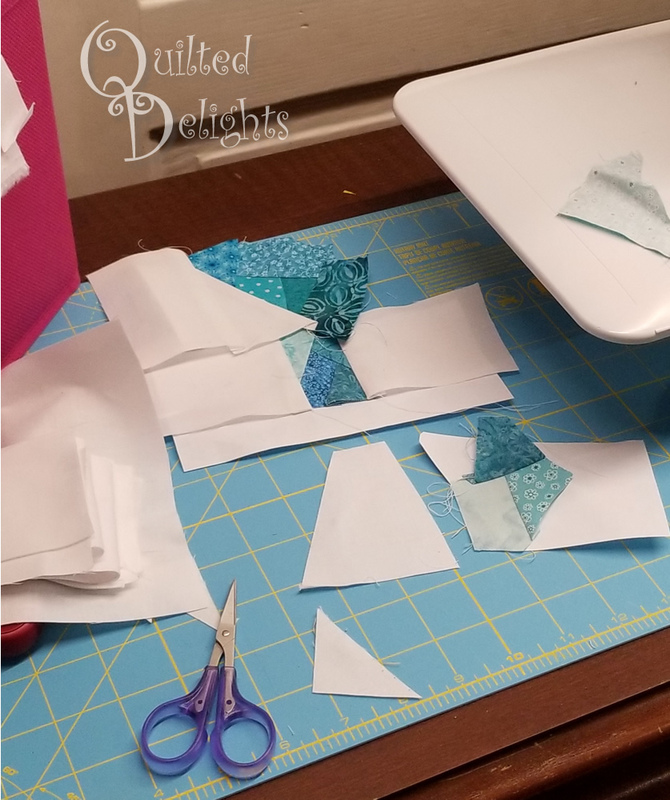 Or if you are cutting a lot like me you can use the easy angle ruler and cut a 6.5 inch strip and cut your triangles that way. 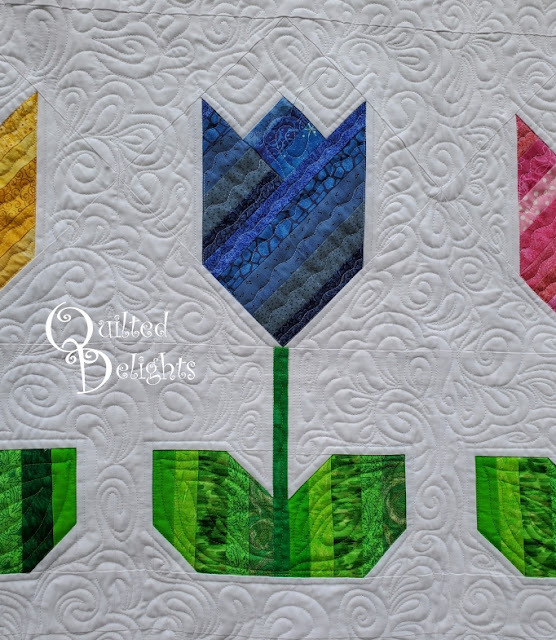 Sew these four white triangles to the tulip block. 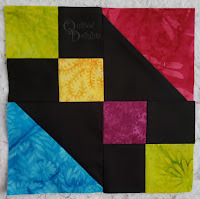 I sewed opposite sides first, then flipped the block and added the other two sides. For the leaves, make a 10 inch strip of green strings, sub-cut to make two 4.5 inch squares. 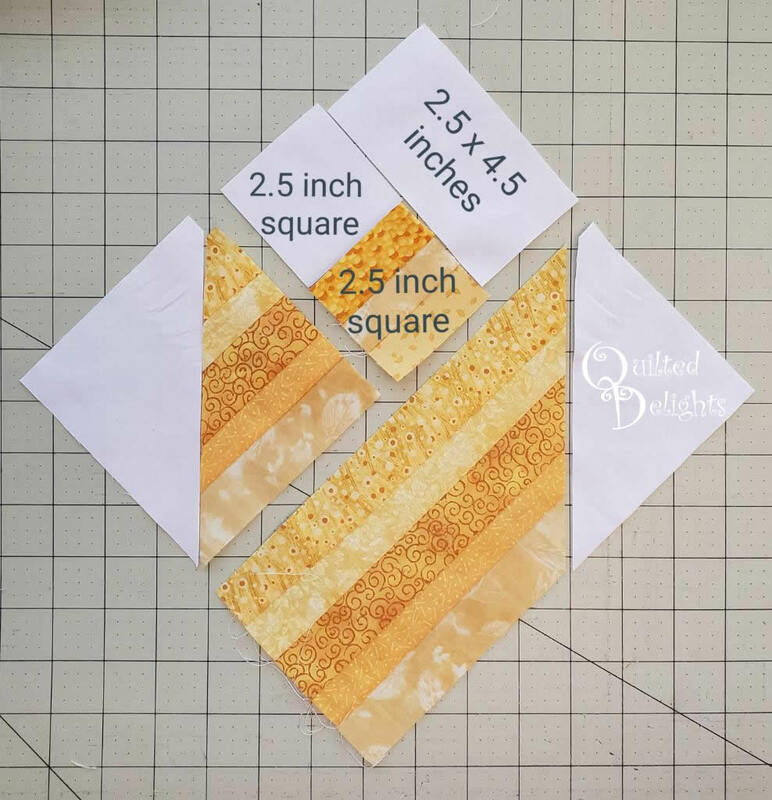 Cut four 2 inch white squares. 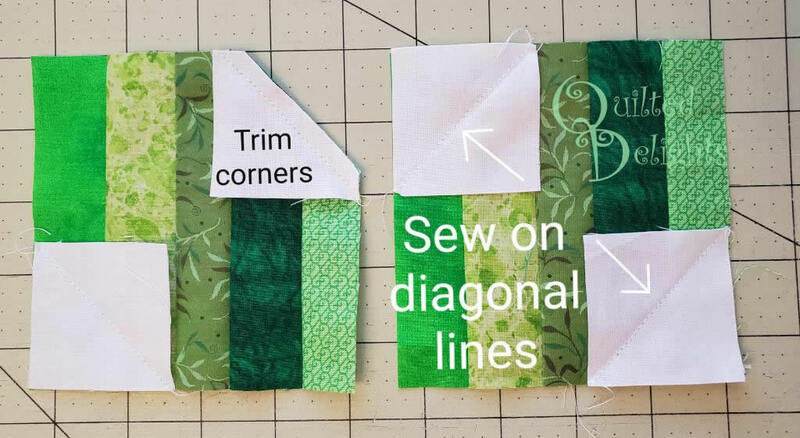 Draw a line on these on the diagonal using your favorite method. I pressed mine in half with the iron to create a sewing line. Align your two green squares side by side with the strings going vertical. Place a white square in the upper right corner and lower left corner of the Left square. Do the opposite for the right square, placing a white square in the upper left and lower right. It is good idea to lay them out by your machine in the way you want to sew them. 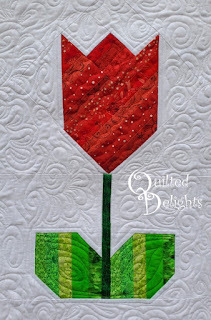 This will save you time you don't want to spend with the seam ripper later. Sew on the line you marked. I like to sew a thread's width on the side of the line towards the seam allowance. 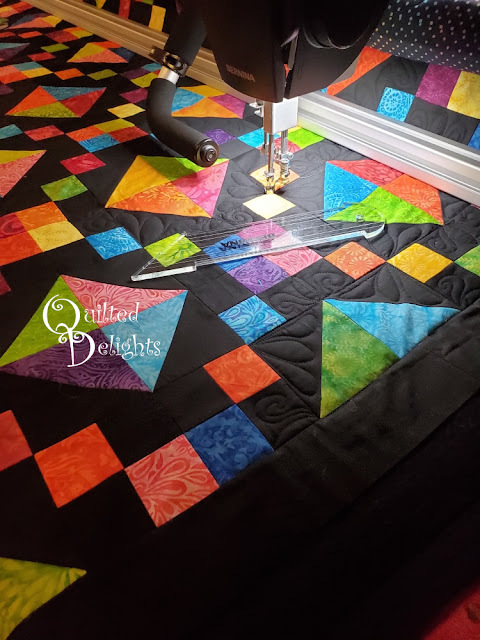 This way my triangle won't shrink when I iron it out. 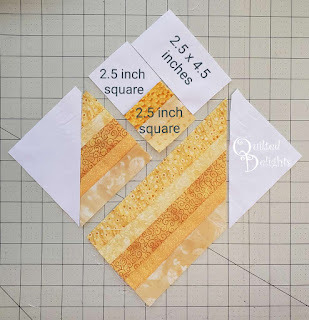 Trim off the excess fabric from each each white corner by cutting 1/4 inches away from the seam. Press. Cut two 4 x 4.5 in white rectangles. Align the 4.5 edges together and sew the white rectangles to the top of the leaf square. 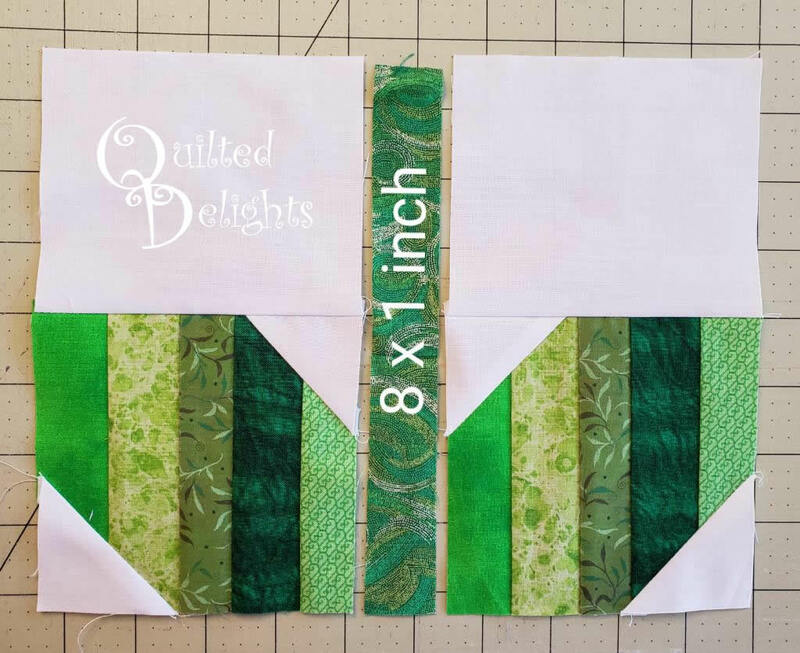 Cut a 1 x 8 inch green strip. 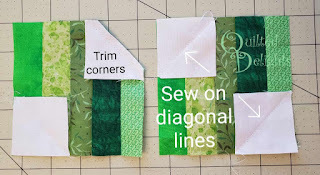 Sew the leave sections to the strip. Cut two 8 x 1 7/8 white strips. Or you can cut them 8 x 2 and trim them down later. 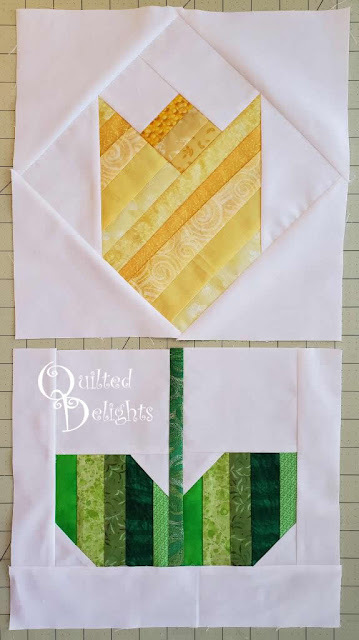 Sew these to the sides of the leaf block. Cut one 2.5 x 11.75 inch white strip. 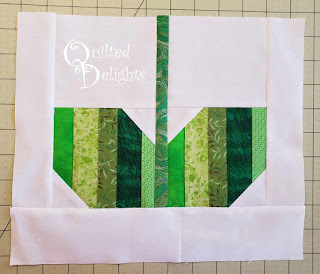 Sew this to the bottom of the leaf block. 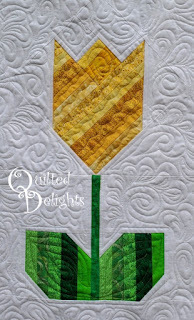 Sew the top of the tulip to the leaf section. 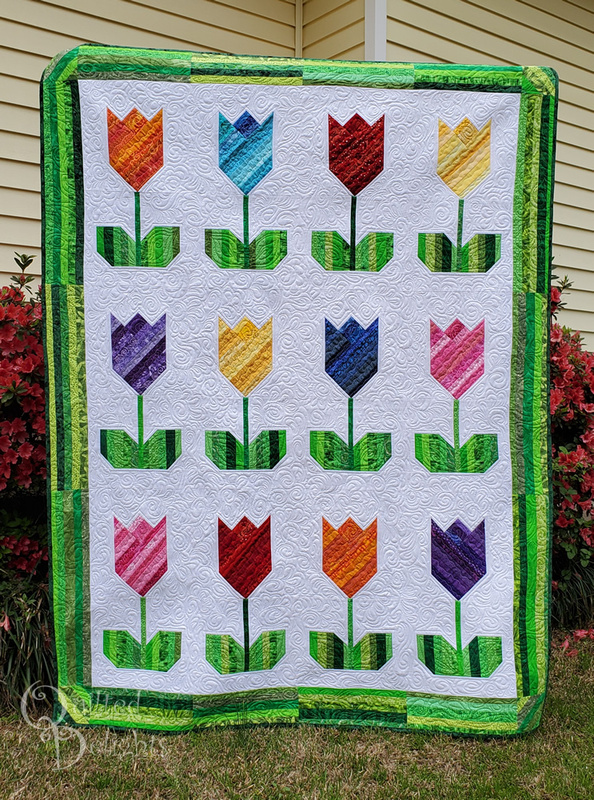 My unfinished tulip block measured 21.5 x 11.75. 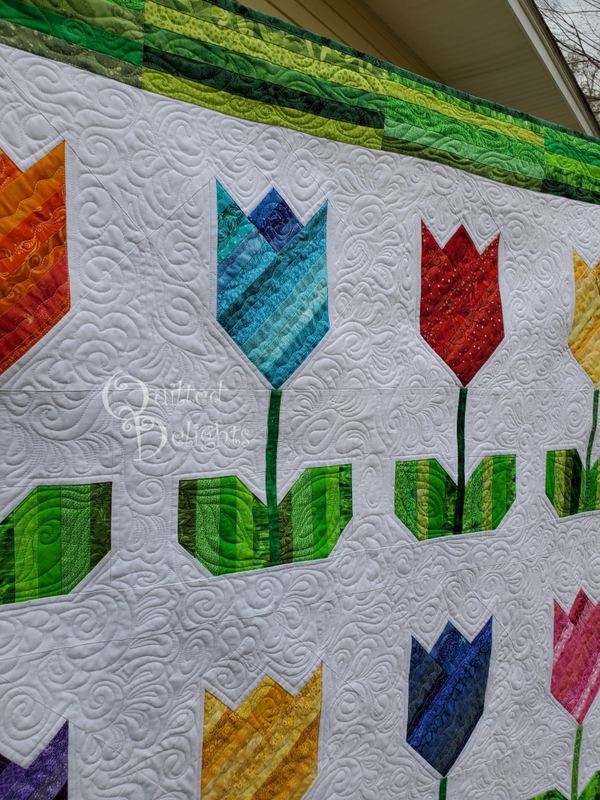 Sewing with triangles always makes things tricky, so if the top of your tulip block comes out wider or smaller, just adjust the width of the white side strips on the leaf section to match the top of your tulip section. 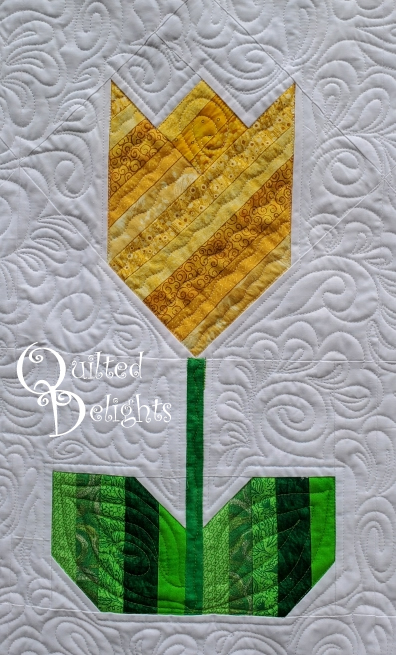 Then cut the length of the bottom 2.5 inch strip to match the width of the top of the tulip. For even more inspiration, here are some throwback images to some of my previous string projects. 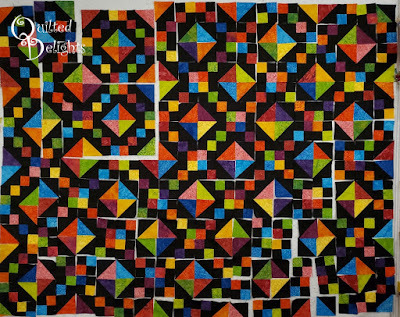 Almost all of them were made for Project Quilting. The Marsh. 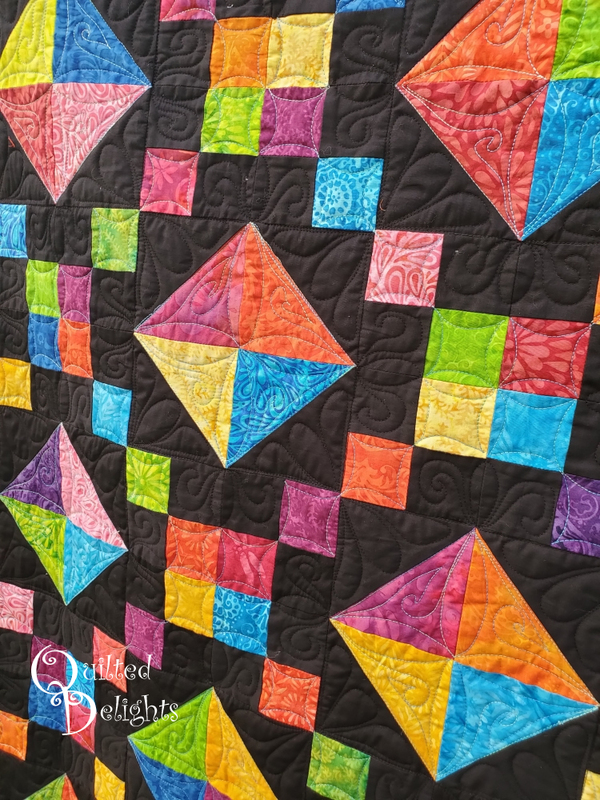 One of my Project Quilting entries from last year. Winter Sleep - Another PQ entry - Theme was trees that week. Lollipop Orchard. - String background. Another PQ entry. Relaxing Starfish - My first ever entry for project Quilting. 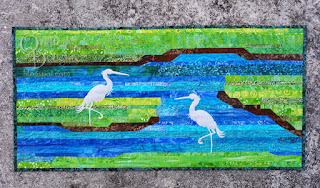 Make sure you find time to check out the other projects being posted today. And if you missed any yesterday, Here is the whole schedule. We will be here all week! ... well at least till Thursday. Quilting & Learning - What a Combo! This was a hard challenge for me this week. Abecedarius: where the first word of every line of a poem follows the alphabet. Or in other words, do something with the alphabet. 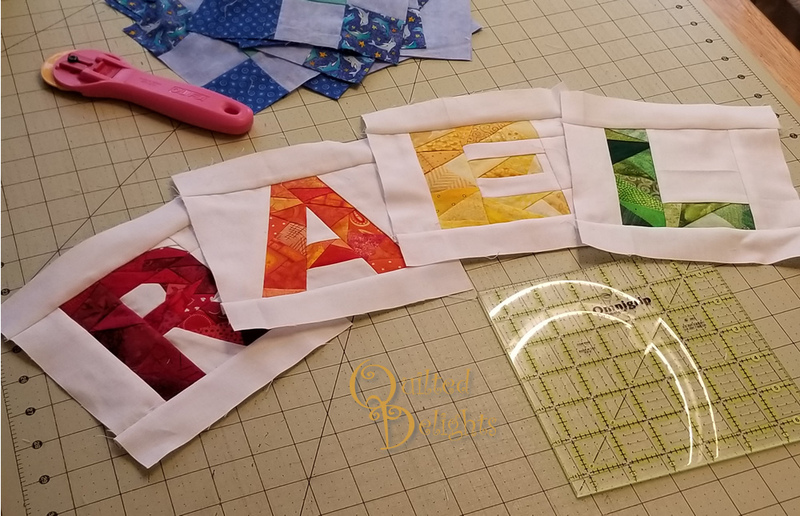 I like words on quilts, but wasn't sure what to do with so many word options. Hubby: Are you going to put their name on it? Me: Yeah, it will be in the label. Hubby: Are you sure you don't want to put their name real big on the front? In the piecing? or glued on there in fabric? Me: This design doesn't call for their name real big on the front. Hubby: Oh, well I think it will make it look good with their name on the front. Real big. So in honor of that I decided to go with a name... real big... on the front. I just had to pick a name. 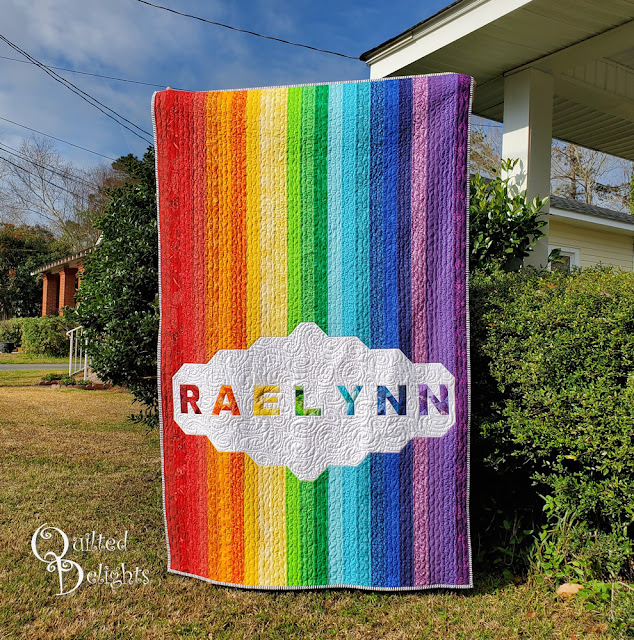 Kid names are the easiest, nieces and nephews are always easy to make quilts for, but which one? I still wanted to keep it somewhat on the theme of Abecedarius, I didn't want to do the whole alphabet though. Just wanted to focus on one letter. I do love to work in rainbow color. So I was going to do "R is for Rainbow" and "R is for (insert name here)". So whose named started with R? 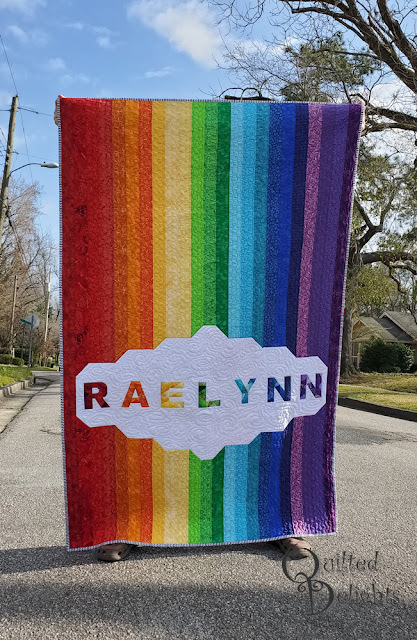 there were several, but one jumped right out at me because her name also had the same number of letters as the colors in the rainbow: Raelynn. Perfect. I love the geometric block letters designed by Quiet Play. They are nice and big and blocky, just what I was looking for. They finish at 6 inches. I just needed a rainbow to go around them. So I got to designing. 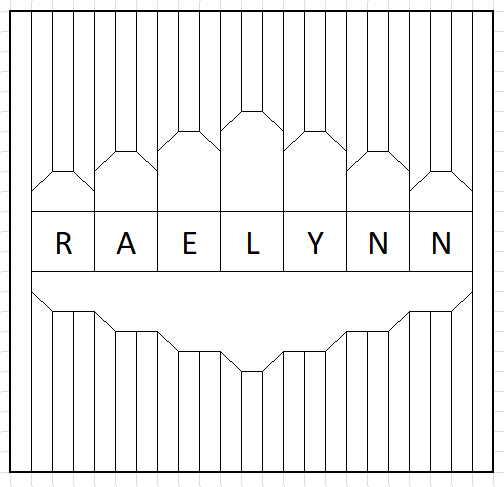 Each letter would represent a color in the rainbow and have three shades of that color in strips above and below it. And since the letters were going to have a white background they could be in a cloud. I used excel for this one. I do have EQ8, but haven't mastered making my own layouts yet and since I was pressed for time I went with what I know I could design with pretty quick. All the strips are 2.5 inches and I needed three of each color plus an extra red and purple for the ends x 2. That is 46 strips. I decided to use the Accuquilt cutter that was sent to me as part of being an Island Batik Ambassador. I used the die that cuts 2.5 strips and cut out all my strips lickety split and they came out perfect. 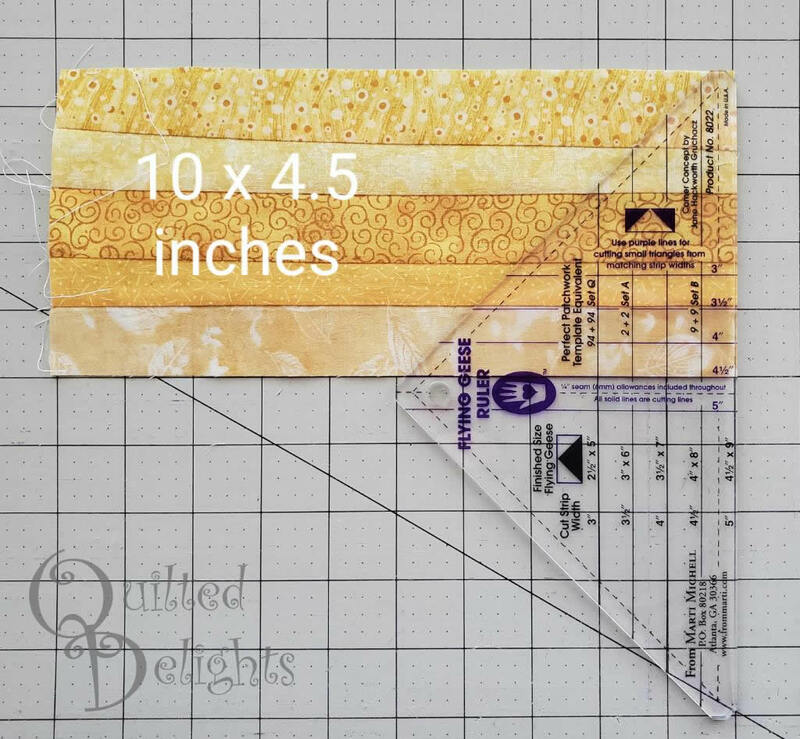 I used to think I was already quick enough cutting 2.5 inch strips with my rotary cutter, but this was super nice and I did it in about the same time and they came out perfect, no shaving off 1/8 of an inch when the ruler moves. 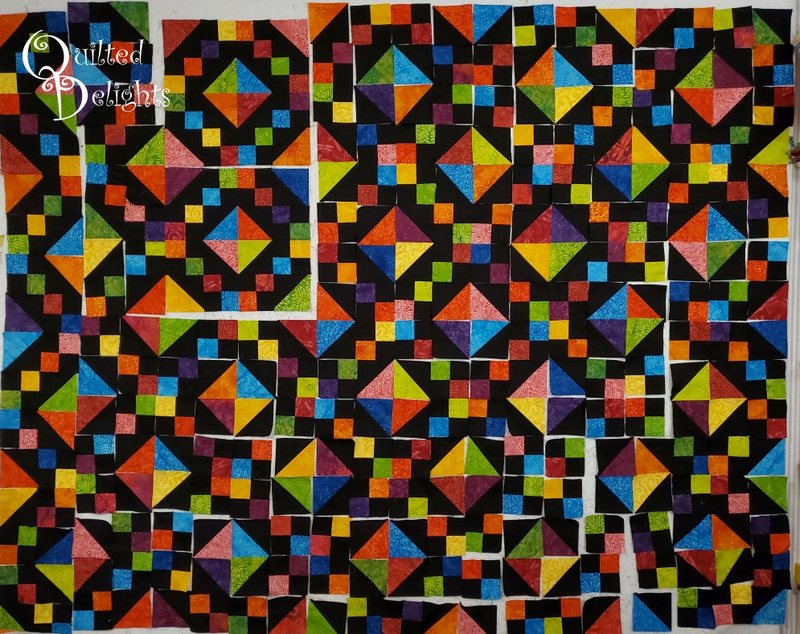 The quilt measures 46 x 72. 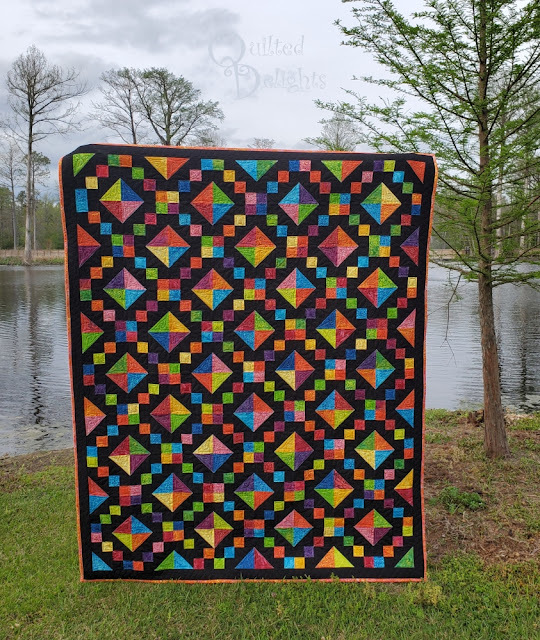 My husband loves this quilt. It has all three things he thinks a quilt should be. 2. Has to have a name on it - on the front. 3. Has to have blue in it. Make sure to check out all the other entries HERE to see how everyone else interpreted the theme. 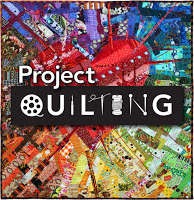 Scroll down till you see all the square thumbnails and at 1 pm central time vote for your favorites by clicking on the red heart in corner.